Our General Manager is Jotham Awiti. Originally from Kenya Jotham joined us when we opened in April 2011. 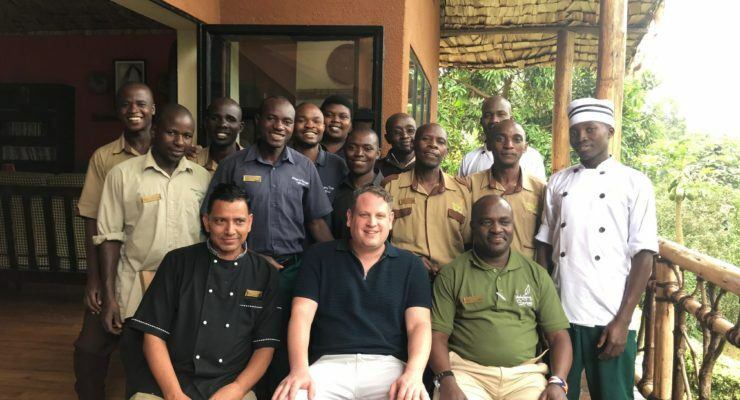 Jotham had previously been managing 6* Safari Lodges in Kenya. Jotham has personally trained all the staff to the highest levels with maximum attention given to customer service. Jotham will ensure that all your needs are exceeded while you stay at Mahogany Springs. Our Assistant Manager and Head Chef is Mahadev Subedi. Originally from Nepal Subedi joined us when we opened in April 2011. Subedi has been cooking in high end safari lodges for over 20 years. His culinary expertise knows no bounds. Subedi has the highest levels of experience in catering to all dietary requirements and food specialities from all parts of the world. All dietary requirements can be fulfilled at Mahogany Springs. Subedi has trained in various parts of the world, most recently patisserie and chocolate making in London. 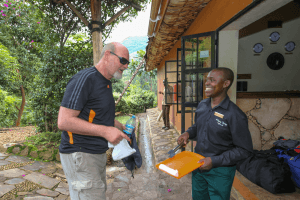 The rest of our team are one big family of people from the local Ugandan community who love hosting clients and showing you the true wonders of Ugandan hospitality.